I devoured the three available Audiobooks in the Forbidden Library series in record time. Then I noted with dismay that I would have to wait for more to be published before I could continue on with one of the best children's fiction series I have ever read or listened to. I am well and truly hooked! And, although it is a big call, it is really the only series I feel absolutely comfortable comparing to Harry Potter, as I believe it has real appeal for fans of the infamous series, both young and old. It is a series that I can see myself returning to again and again. While initially I was a little put off by the sweet, childish, little girl voice of the narrator, Cassandra Morris, as I got to know the main character Alice, I swiftly and firmly changed my mind. Her voice is perfectly pitched and exactly suited to Alice's character, and Morris' performance is flawless. She maintains pace exceptionally well and at no point throughout any of the audiobooks was my attention diverted from the engaging energy of the story. If you're heading on a family holiday or road trip over the spring school holidays, I would enthusiastically encourage you to add this to your roadtrip listening, although hints online suggest that the last instalment of this series is due at the end of this year, so maybe planning on it for the Christmas holiday break will save you from an agonising wait! 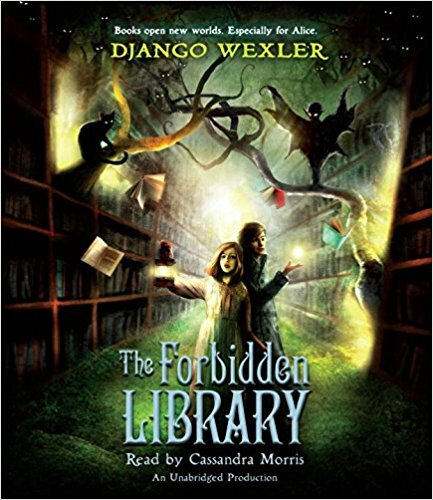 For individual series title reviews see The Forbidden Library (Book 1), and watch this space for reviews of Forbidden Library (Book 2): The Mad Apprentice and Forbidden Library (Book 3): The Palace of Glass.